Crystal skulls are another unexplained and mystical treasure. As a treasure hunter I have a natural curiosity for the mysteries that surround life. I believe that all successful treasure hunters have an inherent ability to search for and understand the world’s unsolved mysteries. Any questions like these, as well as the topic of this page, need to be addressed in a more logical manner, rather than allowing ego’s to control the conversation. If not, then true history will never be taught in our schools, and our children will suffer the consequences. 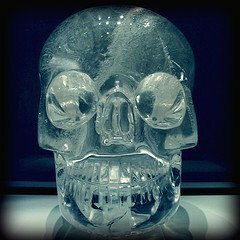 A crystal skull is a replica of human skulls. They have been carved from quartz. Quartz is a pure, clean crystal of silicon dioxide. There are many of these skulls that exist today. Some of these are modern, however, a few have been suspected to be carved centuries ago. Some of these crystal skulls have supposedly existed since the time of the Mayan and Aztec cultures. One in particular, the Mitchell-Hedges skull, has been the most popular of the these skulls. F.A. Mitchell-Hedges who was a writer-adventurer-explorer, and his seventeen-year-old daughter Anna, claimed to have found the skull in 1924. As the story goes, the two found the skull in a temple ruin in the ancient Mayan city of Lubaatun in British Honduras. The story of how Mitchell-Hedges and his daughter found the skull was apparently a fabrication by the explorer who was known to tell tall tales in his writings. Mitchell-Hedges actually purchased the skull at an auction in Sotheby’s in London in 1943. However, the origin and the mystery that surrounds the skull are very real. As I mentioned before, there are a number of these in existence. However, the one that was tested for its validity was the “Skull of Doom”. These tests revealed strange occurrences. The first strange anomaly was the fact that whoever sculpted the skull did not use any metal tools to carve it. There were no signs of any scratches on the crystal. As hard as the surface of the skull is, there should have been some evidence of scratching due to cutting. If no metal tool was used to carve the skull, then what instrument was used? Especially if the skull was carved thousands of years ago when technology was non-existent. In addition to the confusion of how the skull was made is the fact that observers of the skull have watched it change colors. What has also been observed are strange scenes reflected in the eye sockets of the skull. Scenes of buildings, scenery and other objects have been noticed inside the skulls eyes. In 1970 Frank Dorland a crystal carver and skull expert examined the piece. Dorland claimed that the skull originated in Atlantis, the lost, mythical continent, and that it was at one time in the possession of the Knights Templars. Wherever the “Skull of Doom” originated, or for that matter any of the crystal skulls, the story behind these treasures may never be answered. More about crystal skulls here. Dropa Stones, another mysterious artifact. Crystal skulls may never be located in old, ghost towns, but searching for the old sites is a GREAT adventure.